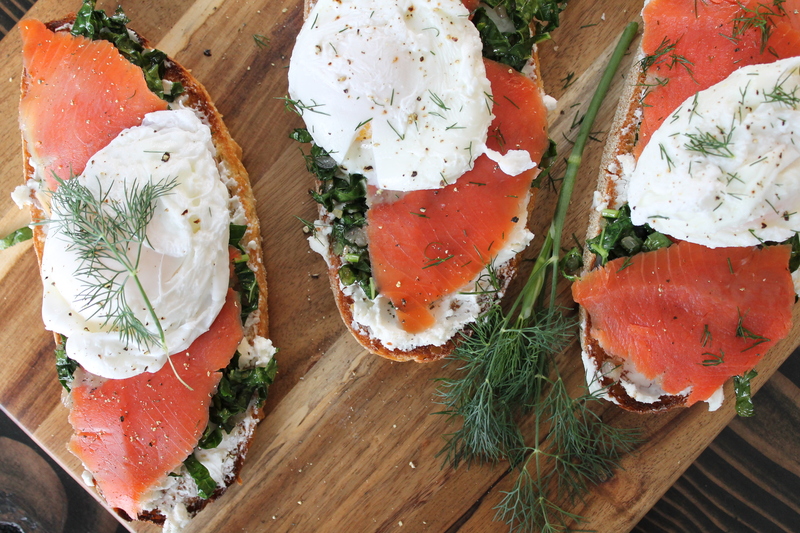 This lunch is what I think you’d get if eggs florentine had a baby with a lox bagel. A few recessive genes shining through, not quite like their parents…but there is a strong family resemblance. Start with shallot, diced. Or sliced. We need to caramelize this in some oil and butter, because the rest of the components of this meal are salty and briny and smoky, and trust me, you will want a little sweetness for balance. Cook the shallot over low heat, stirring occasionally to prevent it from burning, until it is dark brown and glistening. We got slightly impatient (see previous discussion of impromptu meal) and didn’t fully caramelize the shallot, which was still very good, but not quiiiiiite amazing. Now kale. 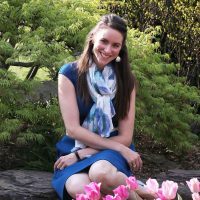 I am growing lacinato kale in my garden this year! It is really growing like gangbusters, so it’s helping me to achieve my greens-at-every-meal goal. Thinly slice the kale. Slice the kale into ribbons and then toss it in with the caramelized shallots. Stir until the kale wilts slightly but is still bright green. Remove from the heat and season very lightly with salt. Now it’s time to toast some bread and poach some eggs! Slice the bread (we used a sourdough boule, but any kind of bread will do) and brush it lightly with olive oil. Toast it under the broiler until crisp on top. The bread is the foundation of a rather large sandwich, and it is the only crunch in the whole dish, so don’t wimp out. Likewise, don’t let it burn to a crisp. Brown edges, golden center. Bring water and a generous splash of vinegar to a low boil. Yes, let it boil. A simmer is so gentle, and that’s great, but I find that my eggs stay together better if the water is basically fizzing. Crack the eggs into a bowl, then slide them out of the bowl into the water. The reason you should crack an egg into a separate bowl is so you can control how quickly it enters the hot water: too quickly, as if you cracked directly into the water, and it will make waves that will likely cause the egg to come apart. But should your egg start to look like it is coming apart, don’t fret! Just grab two spoons and lightly scoop the white back toward the yolk for a few seconds, until the warm water sets the shape of the egg. Poach for about 2 minutes to get a nice, firm white and a beautiful, warm, runny yolk. I poached our eggs two at a time. Scoop the eggs out of the water with a spider scoop or mesh strainer. When the bread is toasted, pull it out of the broiler and immediately rub with half a clove of garlic. This is hot work, but it will leave such a delectable essence of garlic: don’t skip this! Spread goat cheese over the warm bread, as much as you like. Sarah gave us a rather generous amount, about 6 oz. 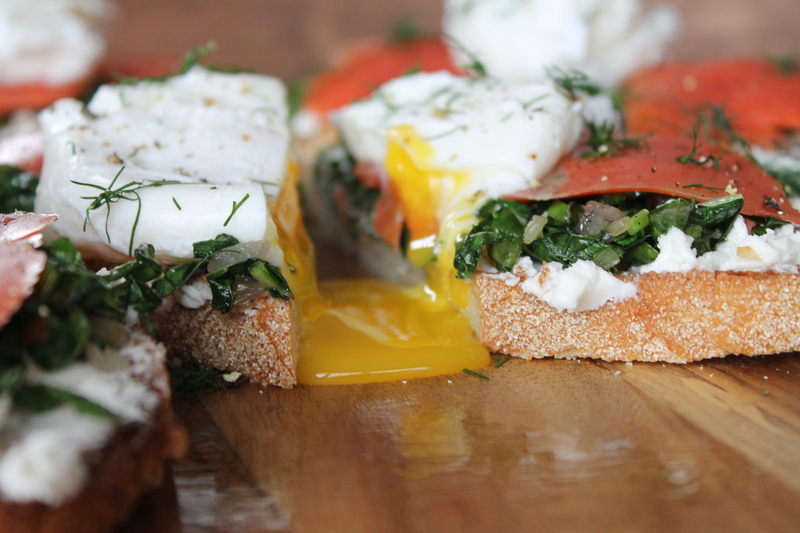 divided between four slices of bread, but even a thin coating of goat cheese will work! Suit your tastes. 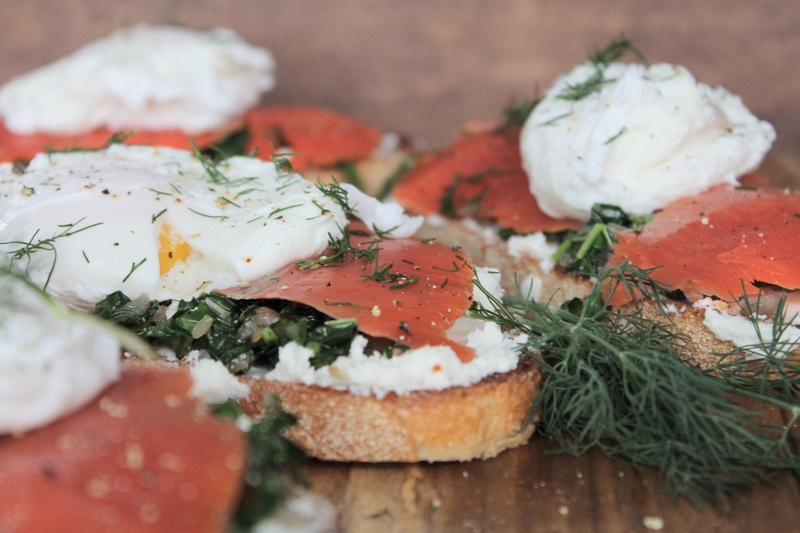 Top the goat cheese with a handful of nonpareil capers, the sautéed kale, and a layer of smoked salmon. Gently place the poached eggs on top. Sprinkle with black pepper and fresh dill. Yum! P.S., this is really fork food. I mean, I know it’s on top of bread, but it’s super messy. Just a warning. Heat 1 tbsp. olive oil and butter in a large skillet over medium heat. Add the shallots and sauté for 2 minutes, until tender and nearly translucent. 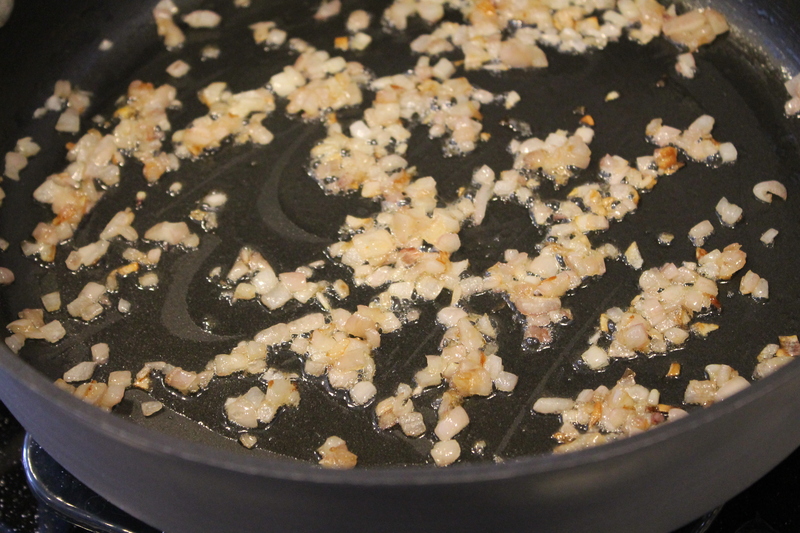 Lower the heat and allow the shallots to caramelize slowly, stirring occasionally, about 10–15 minutes. 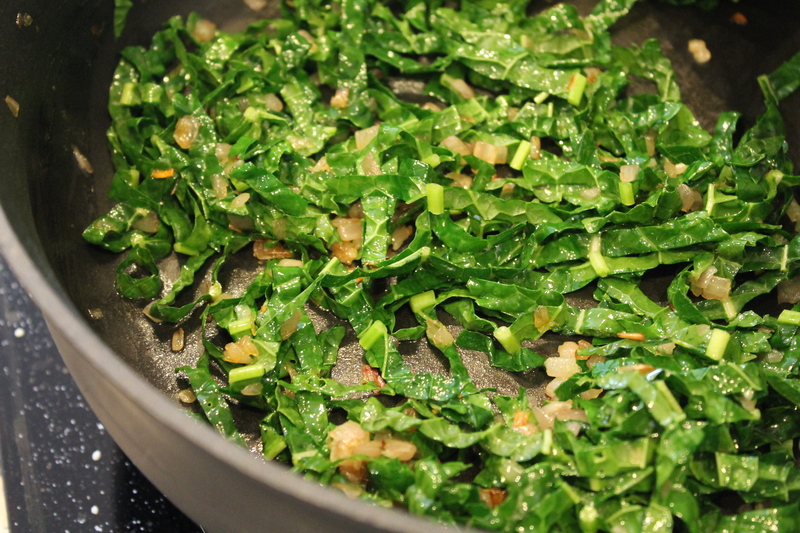 When the shallots are deep brown and glistening, add the sliced kale. Cook until the kale wilts, stirring regularly. The kale should still be bright green. Season lightly with salt. Remove from the heat and transfer to a bowl or plate to prevent the kale from browning in the pan. Brush the bread with the remaining olive oil and place flat on a cookie sheet. Broil for 2 minutes, or until golden and crisp on top. 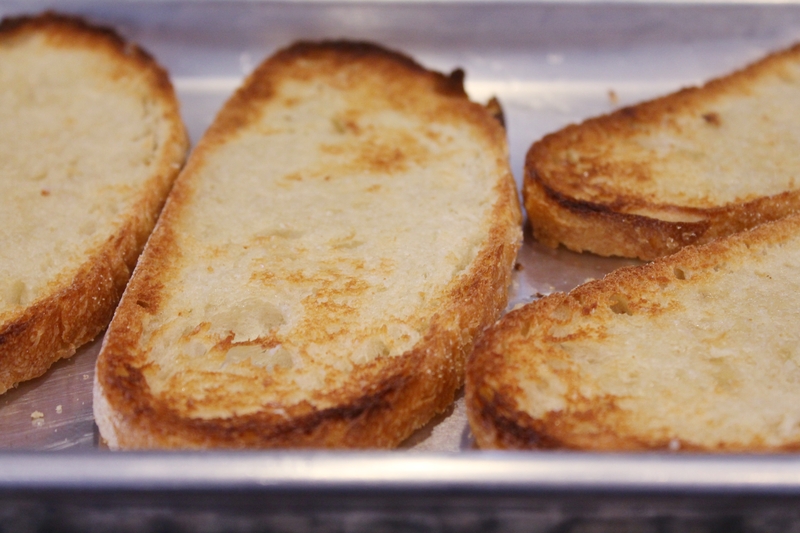 Immediately cut the garlic clove in half and rub the cut side over the warm toast. 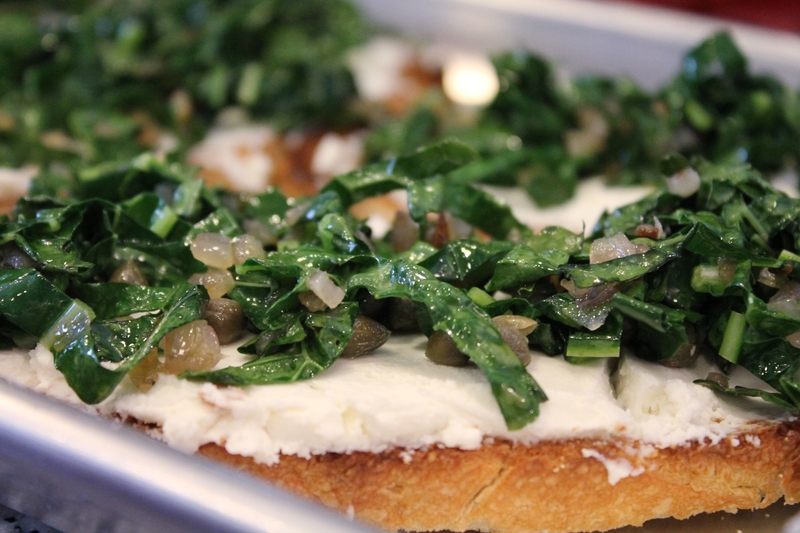 Spread a thin layer of goat cheese over the toast, followed by a sprinkle of capers. Divide the kale mixture among the slices of bread. Top with a single layer of smoked salmon. 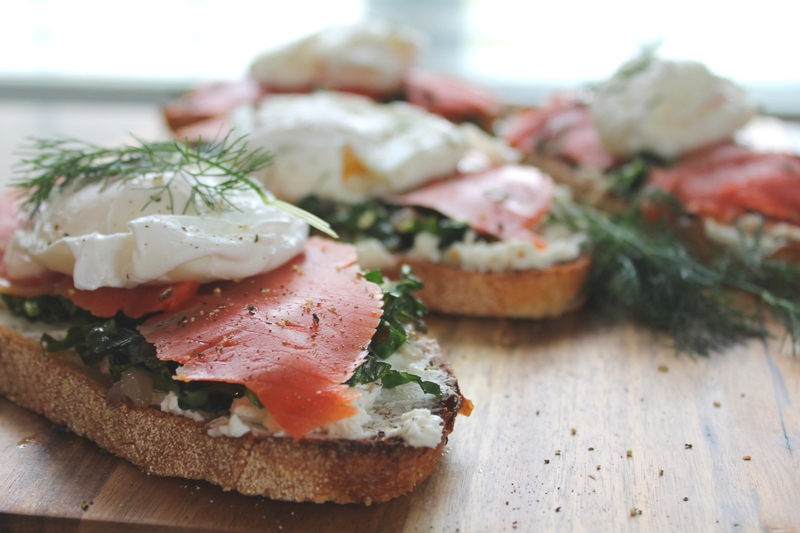 Set the eggs in the center of the smoked salmon toasts. Top with black pepper and fresh dill. So good. I love how we can’t seem to keep it simple, lol – foodie problems.